When your home needs a fresh coat of paint, think seriously about hiring commercial painting professionals to handle the work. There are several potential benefits beyond the convenience of not having to do the painting yourself. You’ve probably been in homes where a bit of wall color shows up on the ceiling or where variations in the thickness of paint coatings are obvious. Maybe you’ve noticed some of these mishaps in your own home. When professionals handle interior and exterior jobs, you can be confident they have the equipment, training, and expertise to leave you with beautiful results. Clean lines and even coverage set top-quality paint jobs apart from others. If you want to have a decorative design created on your wall, the work of experts is especially vital. Whether you pay for paint and invest your own time or hire commercial painting experts to do the work for you, there will be an investment of some sort. The decision to hire professionals reduces your time investment. Rather than setting aside hours to move furniture, tape the room, and buy supplies, you can devote your time to other priorities. Professionals will do the work for you and are likely to get the job done much more quickly than you could. 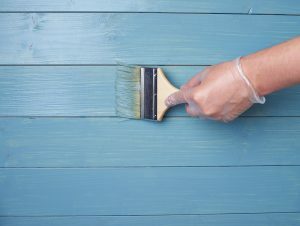 Some homeowners who’ve attempted DIY painting have found that they would have paid less if they had hired professionals. Mistakes in choosing colors or the wrong type of paint or in taping around door knobs, etc., could lead to increased costs. Any type of home improvement work can be stressful. After all, you are affecting the comfort and appeal of your own home. Any mistakes you make while preparing or painting could lead to frustration for years to come. The stress is likely to mount with each step of the task, from choosing paint colors for each room to buying the right types of tools and supplies. If you’re ready to update the colors of your home or add a decorative element to a room, turn to commercial painting experts. You’re likely to get better results in a shorter amount of time with less overall stress.